This document discusses web service security principles, using the OAuth 2.0 Authorization Framework. This document was most recently updated in November, 2015. It is intended for entry-level web service programmers. In your second-year web programming courses, you learned how to implement security for a web app. How was that done? First, you created an identity store. Credentials were defined, and maybe other account-related properties (name, age, etc.). The storage and credential management bits were also created. Then, you created a form (or some other user interface) to gather credentials from the user. After validation, the response from the server would typically include an authorization cookie, and perhaps a response header. Does this work for a web service? Requests to a web service are made programmatically. Responses are typically JSON. Not HTML. So there’s no opportunity to present a user interface for authentication. And there are other problems. The biggest problem is that the human user may not be directly using the resources published by the web service. Instead, a client app may be making requests on behalf of a human user. What about “HTTP Basic Authentication” – will that work? RFC 7235 defines “authentication” in the 723x series of RFCs. Should you use this scheme? An access token is a digital asset, which contains descriptive information about the requestor, and therefore can represent the right to perform a task. It is generated when a requestor authenticates, and then is used to authorize access to a resource. There is no ‘standard’ format for the content of an access token. However, the JSON web token (JWT) is popular. A requestor obtains an access token after authenticating with a token issuing server. A resource server can ask the issuer whether the token is valid. The access token is the digital asset that is used to authorize access to a web service resource. It includes information about the user, but does not include sensitive data or secrets. Today, we will look at the second approach, by studying the OAuth 2 Authorization Framework. So how do we handle security in 2015 and beyond? 1. The first scenario covers the use case where a client app, which does not yet have a valid access token, requests a protected resource. 2. The second scenario covers the use case where a client app, which has a valid access token, requests a protected resource. A separate client app, perhaps an iOS app, or an ASP.NET web app, would be used to request resources from the web service. Users of the client app will be able to request their own resources after authenticating. An entity (e.g. an end user, typically a human person, or a proxy such as credentials in a secure/trusted store) capable of granting access to a protected resource. A server that hosts a protected resource. It responds to requests by validating an access token. Also known as a client app, this is an application that makes requests for a protected resource, on behalf of the (human) resource owner, and with its authorization. For a non-Microsoft approach, the OpenID Connect initiative, which does handle identity management, is often used with OAuth. OAuth is a framework that enables a client app to use an access token to request a protected resource. The access token is issued to the client app by an authorization server, with the approval of the resource owner. This document will cover the first flow/scenario, “authorization code”, with a “confidential” client. A separate document will cover the “resource owner password credentials” flow/scenario, with a “confidential” client. That document will be useful to those who are writing an iOS or Android app. The following diagram is a high-level overview of the software components in the scenarios. Notice that a client app is a distinct entity or construct. It must have its own identity that’s separate from a resource owner. A client app can be used by different resource owners. For the following scenarios, the reader can assume that the resource owner credentials and the client app credentials already exist. Further, the authorization server has the programming, UI, and endpoints that enable the maintenance of these credentials. The reader can also assume that the authorization server has the programming, UI, and endpoints that enable the maintenance of authorization grants and access tokens. This scenario covers the use case where a client app, which does not yet have a valid access token, requests a protected resource. This scenario is documented on a sequence diagram, shown below. Each signal is identified with a number in square brackets, [#], and you will find them in the text that follows. How was this sequence diagram created? Click here and read this post for details. A human resource owner, using a web browser, begins interacting with content in a client app. This begins a new “session” between the resource owner‘s user-agent (the web browser), and the client app. The resource owner performs an action (e.g. clicks on a link or a button)  in the web browser, which causes a “GET protected resource” request to be created. The web browser sends the request to the client app . Note: The web browser does NOT typically have/show the protected resource URIs from the resource server. The client app typically publishes (HTML) links that are in its domain, and maintains the mapping/lookup in its executable code. The answer will be “no”, because this is the first request for a protected resource. Again, the answer will be “no” (because this is the first request for a protected resource). Before continuing, the essence of the original “GET protected resource” request must be retained. The sequence (below) will include three (3) HTTP 302 redirects, and we will be unable to persist the original request in a query string parameter. There are several state persistence schemes available to us. For example, the client app can save this information in session state. Or, it can be sent (in the following response) as a web browser cookie. Whatever scheme you select as the programmer, you just need to retrieve the value later, when you need it. 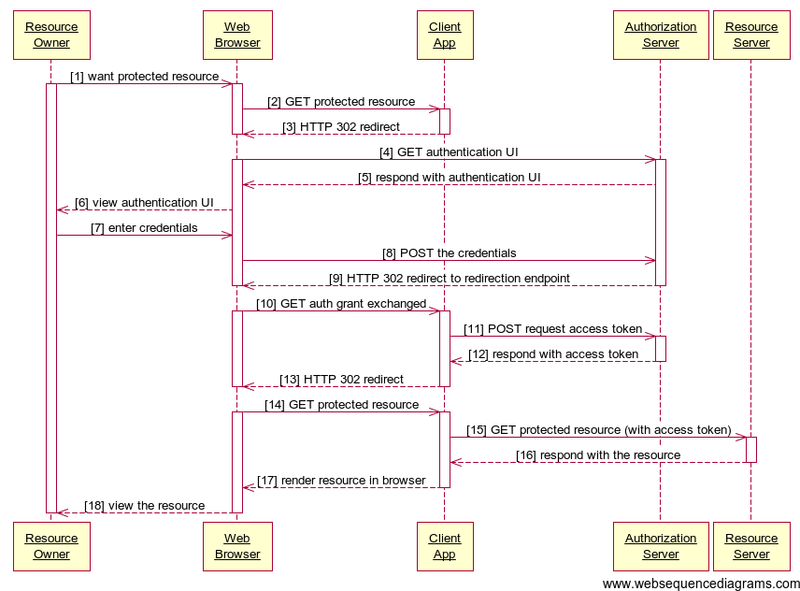 The web browser creates a new request,  “GET authentication UI”, and sends it to the (above) URI of the authorization server‘s authentication UI. Note: The authorization server‘s authentication UI may be a specially-created page/interface, solely for the use of resource owners who want to authorize a client app. Alternatively, it may be the page/interface that is used by other general interactive users of the resource server. The resource owner views the form , enters their credentials , and submits them (typically with a button click). The web browser creates a  “POST resource owner credentials” request, and sends the request to the authorization server. The web browser now has a valid authorization grant. Using the URI from the response’s “location” header, the web browser creates a new request,  “GET authorization grant exchanged”, and sends it to the client app. The answer will be “yes” (because a valid authorization grant was received on the redirection endpoint). Before responding to the web browser, the client app continues with the following. The authorization server will inspect the request. It validates the client app credentials (with a lookup to the authorization store). It validates the authorization grant (with a lookup to the authorization store). If successful, it responds with an access token . Now that the client app has a valid access token, it typically persists it in session state. The client app is now ready to respond to the “GET authorization grant exchanged” request from the web browser (in sequence step 2 above). Upon receipt, the web browser creates a  “GET protected resource” request, and sends it to the client app. This time, the answer will be “yes”. After validating the access token, the resource server responds back to the client app with the requested resource . The client app now has the protected resource that was originally requested. The protected resource is rendered for the web browser , where it can be viewed  by the resource owner. This scenario covers the use case where a client app, which has a valid access token, requests a protected resource. This scenario is documented on a sequence diagram, shown below. Each signal is identified with a number in square brackets, [#], and you will find them in the text that follows. The numbers used for the signals are the same as you saw in the first sequence diagram (but signals 3 through 14 inclusive aren’t there, because this scenario’s client app has a valid access token). As you would expect, the answer will be “yes”. The client app now has the protected resource that was originally requested. The protected resource is rendered  for the web browser, where it can be viewed by the resource owner .